MongoDB 4.0 will add support for multi-document transactions, making it the only database to combine the speed, flexibility, and power of the document model with ACID data integrity guarantees. Through snapshot isolation, transactions provide a globally consistent view of data, and enforce all-or-nothing execution to maintain data integrity. Transactions in MongoDB will feel just like transactions developers are familiar with from relational databases. They will be multi-statement, with similar syntax (e.g. start_transaction and commit_transaction), making them familiar to anyone with prior transaction experience. The changes to MongoDB that enable multi-document transactions will not impact performance for workloads that do not require them. 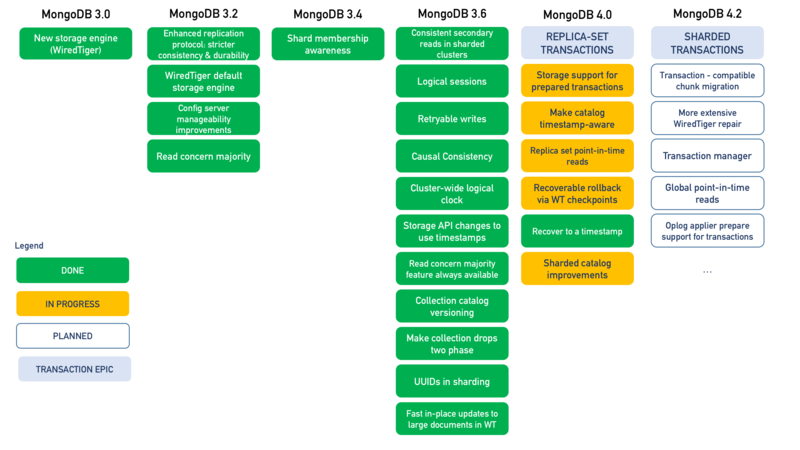 In MongoDB 4.0, which will be released this summer*, transactions will work across a single replica set, and MongoDB 4.2* will support transactions across a sharded deployment. Because documents can bring together related data that would otherwise be modeled across separate parent-child tables in a relational schema, MongoDB’s atomic single-document operations already provide transaction semantics that meet the data integrity needs of the majority of applications. But multi-document transactions will make it easier than ever for developers to address a complete range of use-cases, while for many, simply knowing that they are available will provide critical peace of mind. With MongoDB 4.0, you’ll be able to rely on transactional integrity, regardless of how you model your data. You can read more about our drive to multi-document transactions here. And if you can’t wait to take transactions for a spin, we’d love to have you join our beta program; all the details are at http://mongodb.com/transactions/. Eliot Horowitz is the CTO and Co-Founder of MongoDB. He wrote the core code base for MongoDB starting in 2007, and subsequently built the engineering and product teams. Today, Eliot oversees those teams, and continues to drive technology innovations at MongoDB. Prior to MongoDB, Eliot co-founded and built ShopWiki, a groundbreaking online retail search engine. He built its technology, its team, and presided over its private sale in 2010. Before that, Eliot was a software developer in the R&D group at DoubleClick. Eliot is on the board of the NY Tech Talent Pipeline. In 2006, he was selected as one of BusinessWeek’s Top 25 Entrepreneurs Under Age 25, and in 2015 was named to the Business Insider “Under 35 and Crushing it” list. He was also recently named to Crain’s NY Business 40 Under 40 Class of 2017 list. Eliot received a B.S. in Computer Science from Brown University. This post contains “forward-looking statements” within the meaning of Section 27A of the Securities Act of 1933, as amended, and Section 21E of the Securities Exchange Act of 1934, as amended. Such forward-looking statements are subject to a number of risks, uncertainties, assumptions and other factors that could cause actual results and the timing of certain events to differ materially from future results expressed or implied by the forward-looking statements. Factors that could cause or contribute to such differences include, but are not limited to, those identified our filings with the Securities and Exchange Commission. You should not rely upon forward-looking statements as predictions of future events. Furthermore, such forward-looking statements speak only as of the date of this presentation. In particular, the development, release, and timing of any features or functionality described for MongoDB products remains at MongoDB’s sole discretion. This information is merely intended to outline our general product direction and it should not be relied on in making a purchasing decision nor is this a commitment, promise or legal obligation to deliver any material, code, or functionality. Except as required by law, we undertake no obligation to update any forward-looking statements to reflect events or circumstances after the date of such statements.